Mungo National Park was a fascinating place to visit. All the roads into the park are unsealed becoming impassable after rain, so it was fortunate I was in the area while it was dry. The roads can be rough in parts so if you think your car is delicate best to go in somebody else’s vehicle! Regardless, get yourself there because it’s worth any the bone-shaking on the way. This region is part of the UNESCO World Heritage List and is home to the oldest known human remains in Australia, providing a continuous record of Aboriginal occupation over the past 50,000 years. A good place to visit if you are ever feeling old! 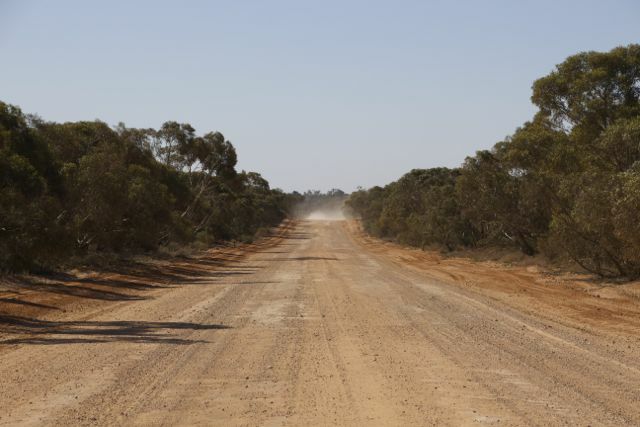 The discovery of the 42,000 year old remains of Mungo Lady and Mungo Man rewrote the book on Australia’s ancient history. The ritual burial sites were some of the oldest remains of modern humans to be found outside of Africa. Mungo Lady, who was discovered first, is the oldest known cremation in the world, representing the early emergence of humanities spiritual beliefs. The area remains a special place for Aboriginals and is cared for by three different tribal groups, The Paakantji / Barkindji, Ngyiampaa and Mutthi people. If the history doesn’t appeal, maybe the landscape will. 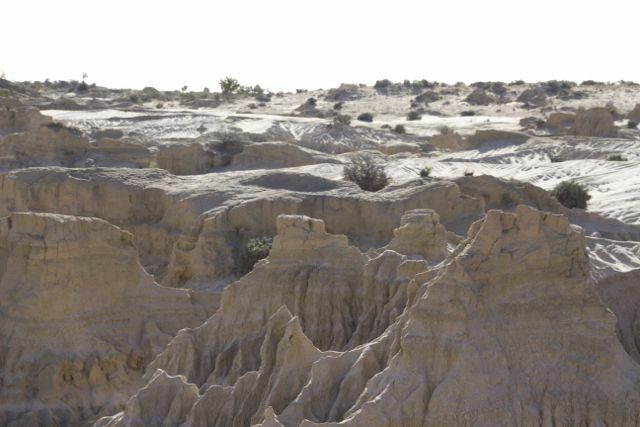 About 20,000 years ago Lake Mungo dried up and became a plain. Dryland plants colonised the area and when sheep farmers arrived in the late 1800’s they found a dense covering of palatable shrubs. Over the next century sheep and cattle grazed in the area on what the visitor centre refers to as a “vegetation overdraft” The lake bed has been resilient but the lunette has suffered extreme wind and rain erosion without the protective plant cover. The “Walls of China” as the Mungo Lunette is more commonly known is impressive. This extract from the park brochure gives a taste of what it’s about……..
Getting around the park is quite straightforward provided you have transport. There’s a self guided 70km driving loop that takes you through the park pointing out some the landmark and history points as you go. One of the stops is at Vigars Well. This used to be a watering hole for coaches back in the day. In fact there are still some visible wagon tracks. It’s also possible to get out and stretch the legs here across the tall dunes. The dunes move an average of 3 metres a year and stretch as far as the eye can see. Easy to get disorientated around here. There was so much wind when I was here my footsteps were being covered over in a matter of minutes so I didn’t stray too far. Another stop on the drive is the old Zanci Homestead. The area was a working station for many years. Here the then owners built a number of buildings in the 1920’s. I like the shots of the stables in particular, showing yet another side to the history of this park. There are so many good reasons to visit this place, I hope I have given you a taste of what to expect and don’t forget there are emus too! Love reading these posts! Amazing insight and down to earth Blog, pardon the pun.